The 1917 New York Yankees season was the 15th season for the Yankees in New York, and the 17th season overall for the franchise. The team finished with a record of 71–82, finishing 28½ games behind the American League champion Chicago White Sox. New York was managed by Bill Donovan. Their home games were played at the Polo Grounds. 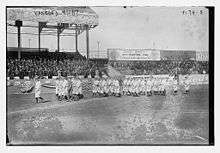 The opening game was against the Boston Red Sox on April 11, 1917, at the Polo Grounds in New York. 16,000 fans were in attendance. The Yankees lost 10-3. Major General Leonard Wood attended the game and threw out the first ball. Wood had drill sergeant Gibson, the recruiting officer from Macon, Georgia, where the team had their spring training, march the Yankees across the field in formation carrying rifles.